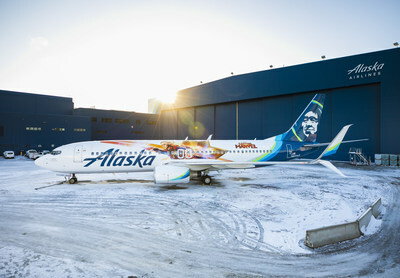 SEATTLE, WASHINGTON, 2019-Feb-07 — /Travel PR News/ — Ahead of the highly-anticipated release of Marvel Studios’ Captain Marvel on March 8, International Women’s Day, Alaska Airlines unveiled a special-edition plane today, featuring Marvel Studios’ first female Super Hero lead. The Captain Marvel-themed plane was debuted today (Feb. 5, 2019) at Sea-Tac International Airport at a gate celebration for guests flying to Orange County, California. Alaska Airlines and its regional partners fly 44 million guests a year to more than 115 destinations with an average of 1,200 daily flights across the United States and to Mexico, Canada and Costa Rica. With Alaska and Alaska Global Partners, guests can earn and redeem miles on flights to more than 900 destinations worldwide. Learn about Alaska’s award-winning service at newsroom.alaskaair.com and blog.alaskaair.com. Alaska Airlines, Virgin America and Horizon Air are subsidiaries of Alaska Air Group (NYSE: ALK). This entry was posted in Airlines, Airports, Business, Entertainment, Flights, Travel, Travel Marketing, Travel Services, Travelers and tagged Alaska Airlines, Captain Marvel, female, Marvel Studios, Mindy Hamilton, Natalie Bowman, Super Hero. Bookmark the permalink.